Have you been to the latest locavore hotspot in Saranac Lake? Farmstead cheeses from North Country Creamery and organic veggies from Juniper Hill Farm are featured regularly. House-made bread is used for sandwiches, with turkey that is roasted onsite. The food is so good and prices so reasonable that business has doubled in the last two years. But you can still get a table without a reservation - and you don’t even need to be a hospital patient or visitor. Adirondack Health is happy to have folks from the community drop in for a meal. This focus on local food is a result of the innovative thinking that Carl Bowen brought to his role when he was hired as Director of Food and Nutritional Services at Adirondack Health in 2014. A Plattsburgh native, with past positions at Mountain Lakes Academy and Northwood School in Lake Placid, Bowen arrived at Adirondack Health ready to make a difference in patients’ lives. Turkey roasted in house is one of the new healthy food options offered by Adirondack Health. “When you’re sick and can only eat a few things, or you’re spending hours here, having healthy food that you enjoy eating makes a huge difference in your day,” said Bowen. 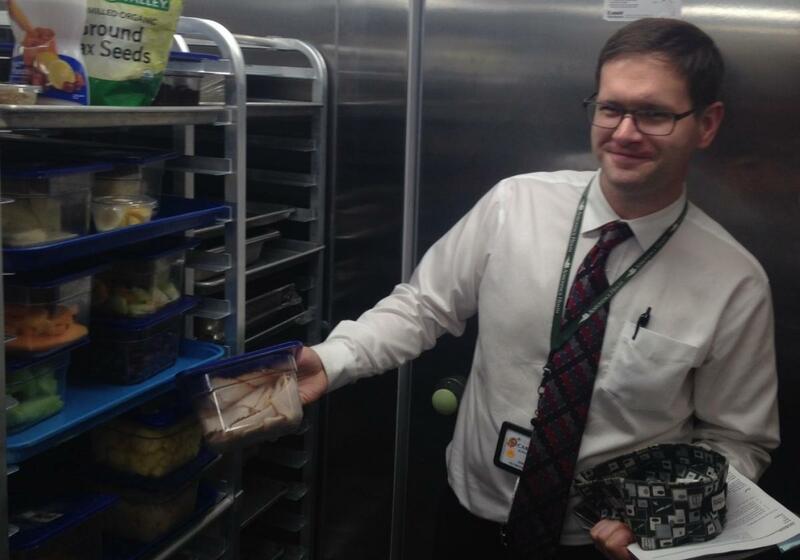 He began slowly - systemic change takes time - but is proud to say that nearly 45% of the food served at Adirondack Health to patients, visitors and staff, is either locally sourced or made in-house. “Our number one job is patient care,” said Bowen, who says this priority drives every decision made about food. Nutrition is critically important to patients, who are now able to more easily select food that accommodates their restrictions. Adirondack Health’s commitment to local food extends to new moms, who are offered a celebratory steak from Kilcoyne Farms of Brasher Falls. Streamlined processes and new computer systems have helped staff provide individualized care to patients and handle the increased demand from staff and visitors. A recent kitchen renovation that updated circa 1967 kitchen equipment will pay for itself within a few years. “Even with these changes, we made sure that the food is still affordable for local families while they are visiting,” said Bowen. 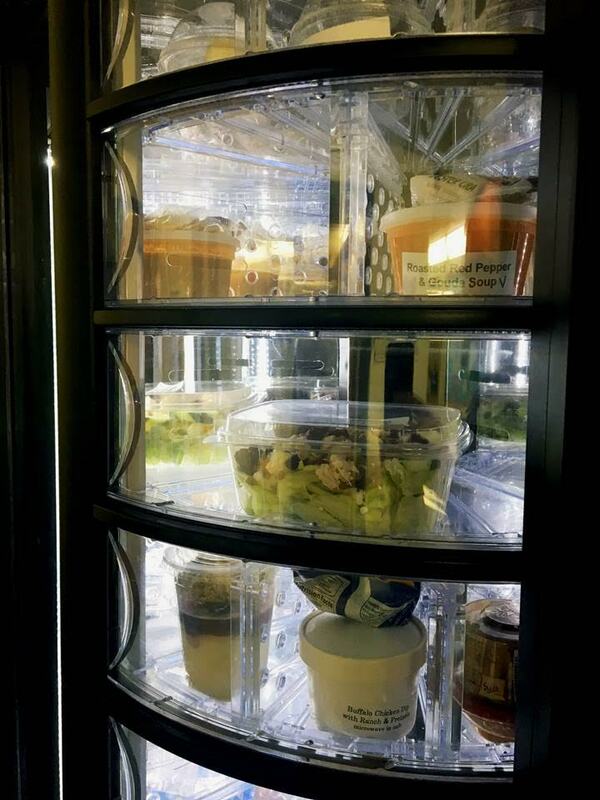 Fresh, healthy vending machine options in the Adirondack Health cafeteria. But when the kitchen is closed, don’t look for Oreos or cheese crackers in the staff vending machines. Bowen’s “non-traditional” approach ensures that healthy food - like roasted red pepper soup or chicken salad - is available 24/7. This local food, healthy food model for cafeterias is a win-win for consumers and regional food producers. We look forward to seeing more examples like this in institutions throughout the North Country.